When you create a Google account, Google enables an option that saves all your queries and the results you clicked on. The service is called Web History and it can be extended to all the web pages you visit if you install Google Toolbar. Web History has many uses, but Google has barely scratched the surface by offering some basic recommendations and trends. Google decided to personalize the suggestions offered when you type a query on Google's homepage by adding searches from your history. Like in Firefox's search box, the historical queries are displayed at the top, but the major difference is that Firefox saves the searches on your computer, while Google saves them in your account. 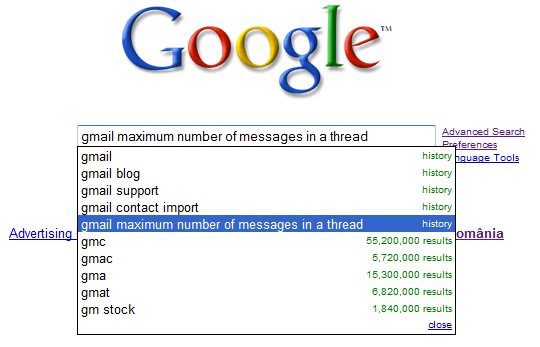 In the screenshot below, you can see the suggestions provided by Google after typing [gm] in the search box: there are 5 suggestions from my search history (all related to Gmail) and 5 popular queries from Google Suggest. Google doesn't provide a way to disable the suggestions from your search history, so your options are to log out, disable query suggestions from the preferences page or delete the web history. Update: I don't see this feature in all my accounts, so it's not available to everyone. Although not directly related to the above, I sometimes get confused on the search result like showing my site as #1 for a particular keyphrase. This despite me not clicking on search results but just looking at it. I couldn't understand why my site became number one. I doubt if my use of webmaster tools has influence search engine results favoring my site (although I'm the only one who can view the biased result). Did you find an answer to the maximum number of conversations in a thread? I get nothing useful... And now I'm curious. Thanks! I had a thread break apart after 60 messages and I couldn't find an explanation for that. It's a pretty small number, if you ask me. I think 100 would be more appropriate. For me the conversations are always cut after 100 messages. The 101st starts a new thread. Google Toolbar includes a feature that seems similar, but it's quite different. It list previous searches from your local search history, which is saved on your computer. The history is only available if you use the same computer and the same browser. Yes some also my sites gets on the number as I use the Google search in the history. Its cool and even makes keyphrase checking a lot easier. This is a big help for as an internet marketer. I usually searching some helpful searches and some related link was been posted in the history. Totally cool and now keyphrase checking just got easier! Very useful feature. Shows search trends very well. it's really a convenient and useful information for SEO exports. thank you very much for such useful services. is there a way to disable this feature ?